My vote is filled out, and ready to go in the mail. It's sad that I need to vote before the leader debates, but it has to arrive by the same election day the rest of you scrubs vote, or it's not counted. It's actually a very reasonable process. You proactively register to vote in the riding of your last permanent address in Canada, and provide your new mailing address. They will contact you occasionally by mail to make sure your info is up to date (even with the occasional reminder email, if you're one of those 'computer' folk). You can register (or remain registered) up to five years from the date of your departure, after which you are no longer considered eligible to vote. 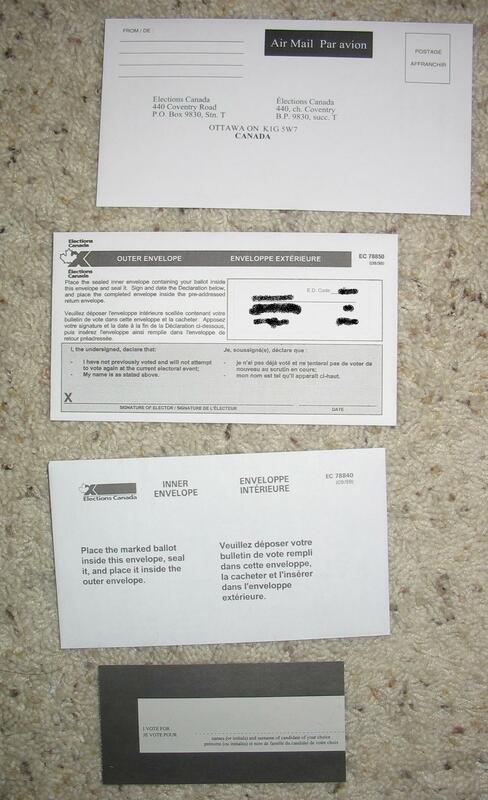 When an election is called, they print up your 'special' ballot and mail it out to you, right away! A ballot. Literally just a dotted line to write a name, so don't make a mistake! But then, no less than THREE envelopes. Inner envelope. Votes need to be private, after all, so they give you a small unmarked envelope that actually goes in the ballot box on election day. Outer envelope. Your vote needs to be private, but also unique. Name, riding, and various uniquely identifying marks clearly on the envelope, and a dotted line to sign saying that this is your one and only vote for the election. I might have spilled some Photoshop on it. Mailing envelope. Since your name and signature need to be private, right? Plus nice and addressed. But sorry, you have to pay your own postage. Pretty easy! It's my last election (anywhere!) for awhile, so I'm making it count. Who did I vote for? Well, you can probably guess, and it's something I enjoy sharing, but that can wait for the next post.